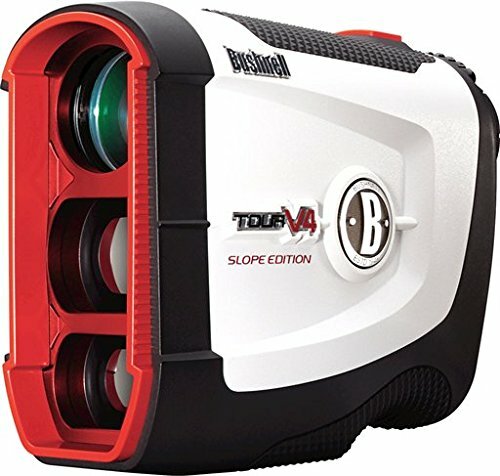 The Tour V4 is one of the latest rangefinders from Bushnell, and it is up to 30% smaller than the V3 that came before it. This device can measure up to 1000 yards and more than 400 to the flag while maintaining and accuracy of +/-1 yard. It has a five times magnification feature that makes objects appear closer than they are. However, the PinSeeker with Jolt and the Slope compensating function are what make it a best golf rangefinder device that a golfer should have when on the green. The Tour V4 is one of the latest rangefinders from Bushnell, and it is up to 30% smaller than the V3 that came before it. This device can measure up to 1000 yards and more than 400 to the flag while maintaining an accuracy of +/-1 yard. It has a five times magnification feature that makes objects appear closer than they are. However, the PinSeeker with Jolt and the Slope compensating function are what make it the best golf rangefinder device that a golfer should have when on the green. Performance: It has a ranging performance of between 5 and 1000 yards and more than 400 yards to the flag. This long distance is very impressive but what makes it more appealing is that it maintains and accuracy of +/- 1 yard. PinSeeker with Jolt: This rangefinder has a PinSeeker technology that lets you locate the pin and Jolt Technology that makes it vibrate when you lock onto it. These two features are vital in the game as they will speed up play and help you improve your performance. 5x magnification: Objects will appear up to five times closer, and this is thanks to the five times magnification feature. Fast Focus Feature: The fast focus feature is one of the most notable things about this device, and it will also help you locate and concentrate on the target very quickly. 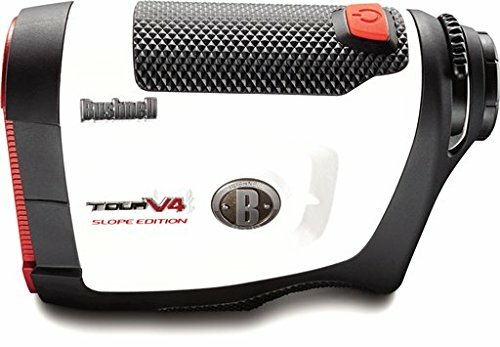 Slope Compensation: Bushnell Tour V4 utilizes the patented technology to compensate for changes in elevation and hence ensuring that you get accurate measurements every time. Rainproof: The device has a rainproof casing, and this makes it possible to use it under rainy conditions as this will not affect its performance. The biggest benefit that you get from using the Bushnell V4 Slope is speed and accuracy in measuring distances on the course. Apart from this, you will also benefit from the impressive slope adjustment feature that will give you distances to the target with an adjustment for slope. There are also many other benefits that you will get from the device such as the vibrating effect of the Jolt technology that will let you know when you lock onto the target. It is faster than most other Bushnell rangefinders that come before it and also those from other brands. The slope compensating feature means that you get more accurate readings since it adjusts for elevation. This rangefinder makes vibrations when it locks onto the flag. Things appear closer when using this device since it has an impressive five times magnification. It has an ergonomic design, and it features improved speed and accuracy. You can play several rounds of golf without having to recharge it. Unlike the previous version from Bushnell it does not have the “Mode” button that lets you change its mode of operation. You can quickly get disqualified from a tournament when you push the target button at the wrong time, and it adjusts for slope. 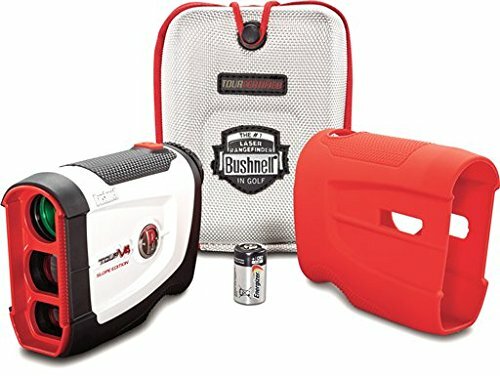 Bushnell has never disappointed when it comes to the manufacture of golf equipment and the V4 Slope also leaves up to this expectation. Its speed and accuracy will impress any golfer, and it is also very affordable when you compare it to other devices on the market. The V4 may have a couple of disadvantages, but it will still do the job, and this makes it worth trying out.